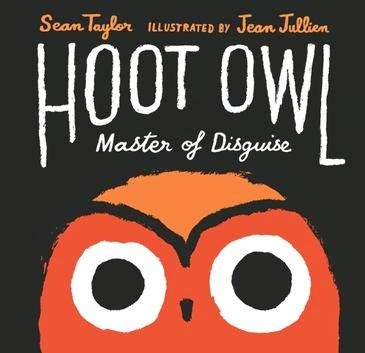 Hoot Owl, Master of Disguise is a children’s picture book written by Sean Taylor, illustrated by Jean Jullien and published by Walker Books Australia, 2014 and Random House in the USA. Hoot Owl is no ordinary owl - oh no! - he's a MASTER OF DISGUISE! And he will use his formidable camouflage powers to trick his unsuspecting prey into succumbing to him! Tiny animals of the night ... BEWARE! But, SOMEHOW, Hoot Owl's prey keeps escaping... Hmmm, perhaps he isn't quite as masterful as he believes. Will he ever succeed in catching himself some dinner? Hilarity, ridiculousness and VERY bad costume changes abound in this wildly inventive new title from Sean Taylor and brand new picture book talent, Jean Jullien. The terrible silence of the night spreads everywhere. But I cut through it like a knife. I love good graphic design and was pulled instantly into Jullien’s illustrations. His bold use of colour on a black background, and amazing ability to portray emotion with a couple of lines, really adds depth to the book, making it one kids won’t forget. There are activity sheets available at the Walker Books website, featuring Jullien’s artwork. Children will enjoy this very funny story as much as I did. They’ll get caught up in the drama, love predicting the outcome of the next cunning plan, and delight in joining in with “I am Hoot Owl, I am hungry, And here I come!” I am so looking forward to reading it to my kids in Storytime at the library - I think we’ll create a Hoot Owl game with some dress-ups, and pierce the library hush with our enjoyment! Hoot Owl, Master of Disguise will move straight onto my list of very favourite children’s picture books for 2015.